Isn’t it great to feel the mastery of a game, the tight mechanics fluidly running from your fingers to the controller with no effort as you destroy complicated levels? 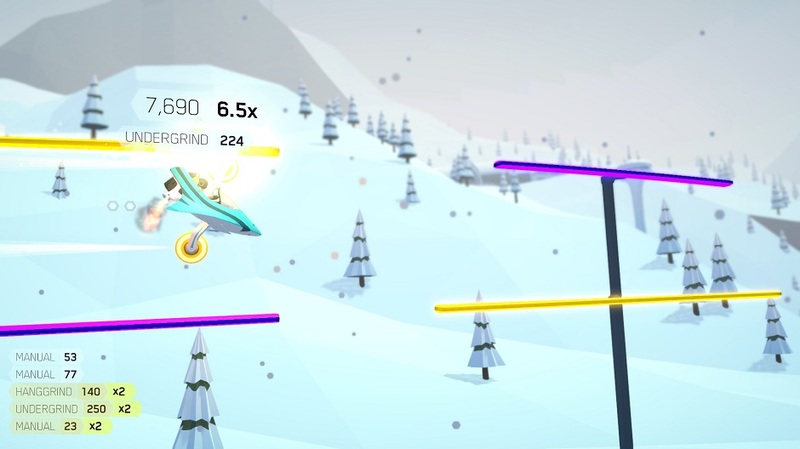 Well, FutureGrind will probably not give that to you without months of practice, but it will give you amazing, infinite chances to get by each level by the skin of your teeth as you yell, laugh and freak out trying to complete levels. Milkbag has made a game that is surprisingly addicting using fairly deep gameplay with simple mechanics that come out to a pretty fun game. You play as a sports star trying to get signed by various companies to ride their various bikes. However, a person reaches out to you in secret telling you things which lead you to believe some of these companies have something more sinister in plans. There are no cutscenes, there are some actual voice lines that are paired with pictures of real people (pretty cheesy) and the rest is delivered by lines of text right before the next level. In all honesty, there is no reason for this story, the game isn’t any better for it and I’m not motivated to continue to know what happens next. But that’s fine, the gameplay is all you need, the challenge of beating the game is what drives the player to keep going. It is silly and fun to hear that you are hacking systems by playing the game, but it is about as forgettable as the name of the person who takes your order at the bar, you’re slightly interested, but it isn’t why you’re there. FutureGrind is all about gameplay. It is simply balancing a bike through a level with wheels that coordinate colors with alternating rails. The game allows you to balance the bike very easily, just the joystick or d-pad. You also have a powerful jump which which varies in style depending on the bike that allows a lot of variety with just basic movement and platforming. The game also gives new bike styles every couple of levels to force you to play the game with new tweaks and quirks keeping things very fresh. When seen in action it looks like chaos and that it would be super difficult to play. However, the bike styles, difficulty and various challenge runs makes the game feel natural in its progression, giving players a chance to grow and pull off crazy stunts. Never did I hit a level that felt impossible, just difficult. It is actually rare in my opinion to find a game that teaches you to play and increases the difficulty as smoothly as this game. If you are unfamiliar with other stunt sports games or arcade games, it will be more difficult, but doable for sure. After completing each level (just getting through it), two challenges appear specifically set for each level; a certain combo number, avoiding other certain rails, not doing flips etc. It adds a lot of extra fun to the game that feels natural to play and totally fair and fun. The sound design is solid, nothing special, but not bad. The music however is surprisingly good. Good enough that I’ve been listening to it outside of the game, adding some to my general EDM playlists. The artist known as bignic has produced 19 tracks that really play well with the game, bringing you into this fun futuristic world. This is one game that as soon as you pick it up, you won’t really stop unless you’re forced to leave the game. Each level is fast, fun and I felt that if I gave the level just one more try I could beat it. I went through 25% of the game in one sitting, and not because it is really short but because I just wanted to play another level. After beating the level and challenges, there isn’t much to do except leader boards and gold trophies on all tracks for points. But this game is so easy and fun to pick up with friends, I would be surprised if you didn’t end up playing it again multiple times just for the fun of it. An important thing in a game like this where you are trying to complete small quick levels is the loading time. I’m currently playing it on Playstation 4 and the game loads quick, once a level is selected it takes an average amount of time to load, maybe a little faster than other games. But as soon as you die and want to play again, it puts you back on the track so fast that you may mess up because you expected at least some delay in loading it back up. This is great, it makes multiple attempts a breeze and beautifully addicting. If this game gets the attention it needs (and honestly deserves), a small DLC pack or free add-on with a bunch of new level or bikes would be a wonderful addiction and keep people engaged. Possibly a level editor could keep the game going for a long time and it would be easy to see a strong following that made and played levels together. FutureGrind is not going to be on every person’s game system, nor should it. It is primarily for the people who enjoy arcade games and love gaming just for the challenge. Just about anyone could pick it up and enjoy it to some extent for sure though. Overall, this game is fun, a lot of fun, and if that is what you want, it is worth the money. It is exactly what you would expect, but in the best way possible. TOEJAM AND EARL: BACK IN THE GROOVE Review: Nostalgic 90's!